BEIJING, China- I walked up to the security checkpoint upon entering the train station in Taizhou. I was on my way to Beijing, and even from half way across the country it was clear that security was beefed up for the 18th National Congress — the series of meetings where the Communist Party would select a new president, vice-president, prime minister, and a host of officials for other top level positions. Going through these train station security checks is usually a mere formality, and it is rare for much vigilance to be shown by the guards. But on this day the metal detector and x-ray machine were manned by bona fide police officers, and there was a line of soldiers standing watch nearby. They demanded my passport and matched the numbers of my residence permit with those of my ticket. The mood was very serious, militant even. The Beijing security crackdown clearly began at all arteries leading into the city — even those a thousand kilometers away. I passed my bag through the metal detector and scooped it up on the other side. I wasn’t expecting any further interaction with the cops, but one quickly stood up and motioned for me to walk over to him. Without a word he put his hands in my face and pantomimed the folding and unfolding of a pocket knife. I then removed the pocket knife from my bag that I’ve carried with me on dozens of trains in China without incident. A police officer then took it and informed me that I would not be able to bring it with me on the train. I protested, though I knew it was futile: I was traveling to Beijing at the time of the National Congress, all types of knives have been formally banned and the city was locked down. Political satire from Chinese netizens. The phrase “Shiba da,” which is what the 18th National Congress is called, is censored on the Chinese social networks, so people have taken to calling it “Sibada,” which means Sparta and sound similar, to get around the censors. This image is from the movie, Sparta, and rather than translating “This is Sparta,” it says “This is the Shiba Da,” meaning the 18th National Congress. It was the day before the start of China’s 18th National Congress, and Beijing was thoroughly prepared for the changing of the guard that was about to commence. I walked over to Tiananmen Square to get a look at the place where the meetings would take place on the following day. But as I walked near the Great Hall of the People a row of burly police officers blocked my path. “It is closed today,” one of them said in English. “What is closed? Tiananmen square?” I replied in Chinese. “It is closed,” he robotically said again in English. Fair enough, I would just forgo gawking at Mao’s dead body and go on my way. 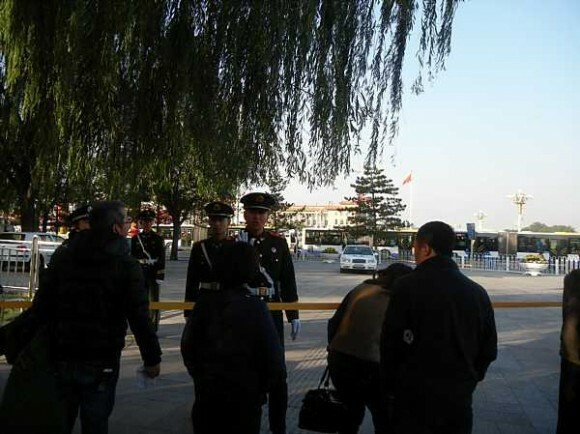 There was no other option: the entire square was surrounding with hundreds, if not thousands, of police officers who had set up a layered perimeter around what would soon become ground zero for China’s biggest governmental meeting in a decade. 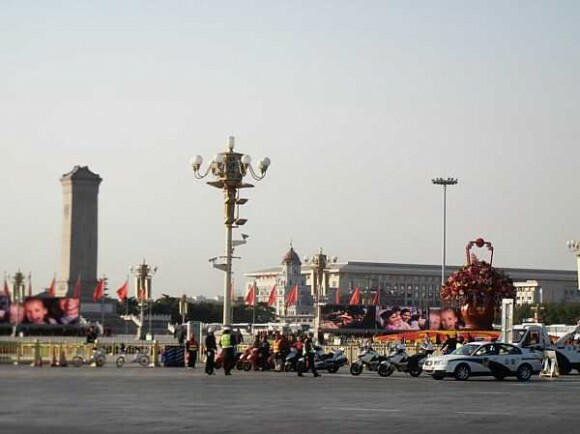 I walked to the other side of the street and looked at Tiananmen square from afar. The public were clearly prohibited from the third largest public square in the world. The only human occupants of the huge, stone tiled, monument filled square were cops and soldiers. I went on with my day, but as I checked the news that night I saw images and videos of Tiananmen full of people waving flags in pure patriotic gusto and read articles about how the Chinese people were excited to receive their new leaders. Hmm, that was not what I saw at all. I returned to Tiananmen the next day to see if I could catch site of one of these entourages of flag wavers (who were more than likely pre-selected and bused in for the photo opp). Again, I was met by a row of a dozen or so cops. “Tiananmen is closed.” Again, the square was virtually empty. Again, later that night I picked up a newspaper and saw photos of all kinds of people frolicking and celebrating in the square. They all had their proper costumes on — there were peasants looking rustic, ethnic minorities looking ethnic, official looking men in suits looking official — and all were waving the red flag of Red China. Again, this wasn’t what I observed at all. Hmm. From what I could tell on the ground, China made it overtly clear that no public participation was needed, wanted, or allowed anywhere near the 18th National Congress, but the Chinese media ran a show of patriotic fervor, public participation, and excitement. It’s a double irony of our times that it is generally taken for granted that places that have names like “The Great Hall of the People” are anything but. Why would I expect anything else? The scene was too typical to even bulk at surprise,almost too normal to even warrant comment. It goes without saying, but managing the two faced line between reality and engineered reality is something the CCP seems to think they’ve mastered. But for all their efforts it’s too bad that so few actually buy it. Though there are no jumbotrons everyone here seems to know the score. In the weeks leading up to the 18th National Congress Beijing introduced a series of rather draconian, invasive, and, some could say, ridiculous security measures. The entourage of police at the train station and having to give up my knife at was not the only way that train travel security was intensified. It was announced in a film by Zhang Zambo that conductors are being awarded $64 a head for reporting potential dissidents that are riding their trains. Apparently, the conductors find these political radicals by listening to their conversations and checking their identification cards, thus turning the Chinese rail lines going to Beijing into a gauntlet for petitioners. Reputedly, the Chinese authorities are on guard against dissidents dumping ping pong balls that have devious political messages written on them into Tiananmen Square as they ride by in taxi cabs. It has been widely reported that Chinese cab drivers have been forced to remove the ability for their passengers to roll down their windows or have control of their door locks because of this. Though some of the cabs in Beijing may have been altered in this way, the ones that I rode in were not. I was able to open, shut, lock, and unlock the doors as I wished, and roll up and down the windows too. But in the climate of Beijing during the National Congress, I do not doubt that the drivers were given this directive — whether or not they obeyed it is a different story all together. But one security crackdown that I can vouch for existing in full is the tightened strangle hold that China put on the internet. In Beijing, I encountered a problem that I was not expecting: the internet censors found a way to prevent my VPN program from connecting. This is how I normally bypass China’s firewall and use the internet freely in this country. But in Beijing I was left with only the Chinese approved internet to work with, and it proved pretty useless. Even my email provider and Google Search were blocked. Though the internet is always highly regulated in China, it was completely locked down for the National Congress. Beijing-based pro-democracy activist Zha Jianguo said he had also been ordered to leave the capital, while the rights website Weiquan Wang said AIDS activist Hu Jia, public interest lawyers Xu Zhiyong, Li Xiongbin and Li Fangping, along with pro-democracy activists Zhang Zuhua, He Depu and Xu Yonghai had already left, or were about to leave, on police orders. There were also a million volunteer security guards with little red armbands employed to walk around Beijing to keep on eye on everyone. Though they were truly ubiquitous they neither appeared very threatening nor did they seem to be doing much beyond going about their normal daily activities or standing around in subway stations chatting with friends or looking incredibly bored. Most of these volunteers were young adults who seemed to like the new fashion accessory hanging from their arm and sense of authority or were old people who seemed to dig the nostalgic flashback to the red arm ban wearing days of their youth. The police blocking of Tiananmen. I had to wonder what this country was so afraid of. Beijing was set up like a stage show, with everything being perfectly choreographed by virtual armies of police officers. Even if someone did shower Tiananmen with ping pong balls with political messages on them the only people who would find them would be the police. There was truly no way to send a message anywhere near ground zero in this city — shows of dissent were not only outlawed, but were made virtually impossible. There are even firefighters on guard in Tiananmen to quickly extinguish any protesters who try to set themselves on fire. 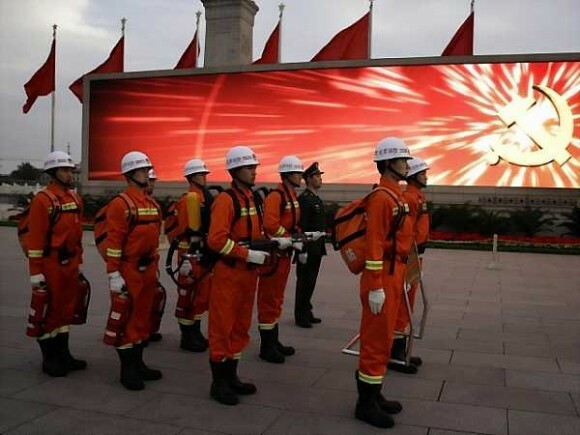 Firefighters in Tiananmen on guard to extinguish any protesters who set themselves on fire. Though Beijing in all respects was locked down during the National Congress, the vibe on the streets was business as usual. During a presidential election in the USA you can hear and see the buzz all around you, during the presidential selection in China there just isn’t much to talk about. The government here tries to keep the lid closed on all things political, any information on political officials is kept as state secrets, delegates are warned not to speak freely to the media. Though it is my impression that this secrecy in itself has the effect of piquing the public’s curiosity, and any information that leaks out about various officials’ shifting alliances, the infighting, stories about rises to power and falls to obscurity, scandal, and corruption become major international news stories. It all unravels like a soap opera — albeit one that everyone has already seen over and over again. A Hollywood screenplay writer could not have scripted a better story than what actually happened in the lead up to this National Congress, and it’s this distance that seemed to create a much wider gulf around Tiananmen Square than any police perimeter could ever create. The Great Hall of the People may as well have been on a remote island for how much impact the ordinary people of China have on what goes on inside of it. This is a government that is selected, not elected. 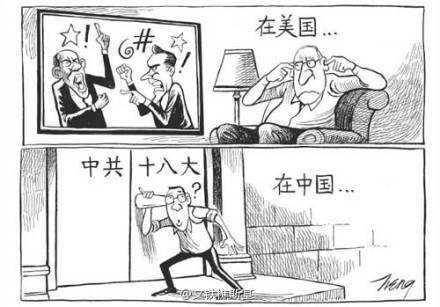 Cartoon by Wang Jinsong showing a key difference between US and Chinese politics. The barricade around the Great Hall of the People was not just security, but was a perfect metaphor for the relationship between this government and their people. The police state that was intensified for the national congress was a reminder of another time when political objectors were sent off to labor camps for reeducation, where the people were subjected to rampant surveillance and invasive security protocols, where youth were given red arm bands and the authority to tattle tale on the adults around them, where the veneer vanished and the political order of things was revealed in the raw. For all intents and purposes, the CCP’s 18th National Congress seemed as if it was taking place in hostile enemy territory rather than on their home turf, in their own capital city. Perhaps they know the score as well.